For this installation our task was to convert a typical theater into a space that takes the viewer on a journey that immerses them into the wonder and beauty of paper fibers. Unlike previous spaces, we could not paint or construct walls and floors. Simple you say, but it is anything but simple. Diagram of the Paper Discovery Center theater. 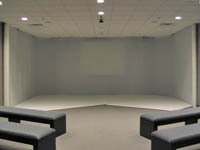 The space provides a working space of 30 feet by 23 feet. The Fiberscapes layout design for the Paper Discovery Center theater. The walls and floors are covered with industrial carpet material. This makes it great for sound dampening, but a real challenge for installing Fiberscapes. One of two creates that hold the Paper Project exhibit and the Fiberscapes installation. Ahead we have lots of work and fortunately a lot of help bringing the piece together. After hanging the wire and laying and cutting the vinyl flooring the space begins to take shape. 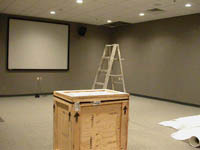 At this time it is only an empty box waiting for the magic of Fiberscapes to fill the space. 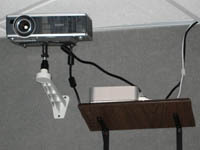 Projectors and small computer systems project the videos used to fill the space from floor to ceiling. Dave Lee of the PDC inspects the final product before opening night. To see more behind the scene work that make Fiberscapes work, look at the Creating Fiberscapes page.